The following was written by Director of Marketing and Communications Janet Magleby, after sitting in on rehearsals this week. Stay tuned for weekly dispatches from the room! Anthony Fusco as Charles, Jessica Kitchens as Elvira, and René Augesen as Ruth; photo by Kevin Berne. As the Blithe Spirit rehearsal picks up after a ten-minute break in the Cal Shakes rehearsal hall, Stage Manager Corrie Bennett announces, “and we’re back.” Rebekah Brockman, playing Edith the maid, practices walking and balancing a silver tea set on a tray. “Let’s start with page 77 and the doorbell,” says Director Mark Rucker. Composer/Sound Designer Will McCandless presses the magic button and the doorbell announces Madam Arcati (Domenique Lozano). She has come to visit Ruth Condomine*, at her request. René Augesen (Ruth) answers the door, invites her in, and instantly offers her some tea. This is when I knew that I’d better eat at the café at the Bruns before I sit down to enjoy this production … all this talk about food is definitely going to make me hungry! Ruth then begins to describe what has happened to her husband and her home since the recent séance. Madame Arcati is thrilled when she realizes that she has accomplished something extraordinary, but apologizes to Ruth and asks how she can help. Blithe Spirit runs Aug 8-Sep 2, 2012 at Cal Shakes. Q: What is Pigeon Pie? After Ruth infuriates and insults Madame Arcati, the medium she leaves in a huff, exclaiming, “You can stew in your own juice!” (For those of you playing at home, that’s food/drink reference number four.) Then, Elvira (Jessica Kitchens—yes, I realize the coincidence here) and Charles (Anthony Fusco) enter. Elvira announces that she’d like a cucumber sandwich, too … alas, she can’t eat in her ethereal state. Ruth is visiting with Mrs. Bradman. Ruth offers Mrs. Bradman a cocktail: “Sherry, perhaps?” Dr. Bradman enters and Ruth offers him Sherry, too. Director Rucker makes several blocking adjustments to assure that they are bringing the action downstage. But for the most part he lets the scene run completely through, without stopping. I am stunned at how well the actors already know their lines and places. The emotion that René employs in playing Ruth is astounding. Corrie announces we’re going back to page 92. Elvira and Charles start again with the line…”Oh, let her go, Charles,” referring to Ruth storming out of the room announcing she’ll have “dinner on a tray.” Anthony wonders how his character will pick up his cocktail with his injured arm. Then a slight interruption as Cal Shakes’ Artistic Director Jonathan Moscone, who has just returned from Italy, unexpectedly drops in. Instant hugs and kisses all around. He is thrilled with the look of the furniture and wondered where we got it. Jon starts noshing on some of the snacks on the actors’ table (he knows the importance of a nice snack) and then is was off as quick as he came. Everyone goes back to work … page 100. I’m headin’ to dinner. Noël Coward’s Blithe Spirit, directed by Mark Rucker, plays Aug 8-Sep 2, 2012 at Cal Shakes’ stunning outdoor Bruns Amphitheater in Orinda, CA. Get your tickets today! No, it doesn't have to be a martini: Coward with cocktail. 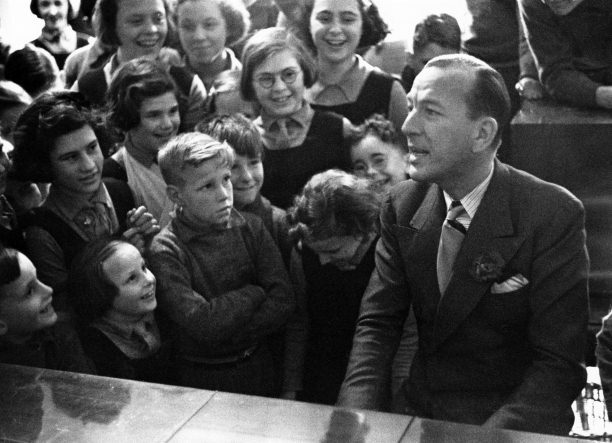 As spirited comedies go, the work of Noël Coward tends to take the boozy cake. The current Cal Shakes script for Blithe Spirit, which will grace our stage August 8–September 2, contains seven uses of the word “martini” (all in speech), ten of the word “cocktail” (eight in stage directions, two in speech), and an intoxicating 18 uses of the word “drink” (nine in speech, nine in stage directions). So it is only proper that we expand our 2012 cocktail contest series beyond the borders of a single event for Blithe Spirit—this contest asks you to think outside of the martini glass and invent a sophisticated cocktail for a chance to see your recipe published in the show program. Post your recipe on Twitter with the hashtag #blithecocktail. Share on our Facebook wall. Cal Shakes’ full production history can be found here; more details about our 39-year history can be found here.